Amid another lively primary season in El Paso County, it comes as no surprise that dirty campaign tactics are being employed once again. This time, it’s Mike Angley who is running a smear campaign against Sheriff Bill Elder. He is fairly new to politics, so he hooked up with some unsavory veteran campaign operatives who make their living lying and smearing any good, conservative Republican candidate they can find for their own personal enrichment. Angley became a willing participant and their latest victim. It is apparently acceptable to Mike Angley to leverage false accusations from disgruntled former employees for his own political gain. Angley was more than willing to pull out a grain of truth and surround it with an array of untruths to purposefully misrepresent the record and character of his opponent. While Mike Angley claims professional superiority over Sheriff Elder, he has never arrested a single person or been inside our county jail. When you run for office, you can choose to simply attack your opponent with lies and half-truths or you can lay out your vision for the office you seek. Sadly, Mr. Angley has chosen the former. Having been around politics for nearly thirty years, one thing I know to be true – that you never get a second chance in politics to get your reputation back. The reputation you earn at your first rodeo is the reputation you keep with you forever - and those who deceive, lie and smear, live mired in that slop the rest of their political lives. This is a sad fact that many newcomers to politics (and old hands alike) learn - but usually after it is too late. Conversely, those who serve with honor, integrity and conviction are revered throughout their career. 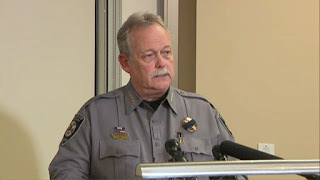 As Angley sends out hit pieces on his opponent, Sheriff Bill Elder’s office has had its hands full with addressing real criminal activity that threatens to destroy El Paso County. El Paso County has had a fearless, aggressive leader in Bill Elder when it comes to combating illegal marijuana grow operations in the eastern portion of the county and the associated crime. He has been an outspoken, national voice on the destructive effects of legalized marijuana on communities. Our sheriff has stood strong on combating illegal immigration. He is standing up to the American Civil Liberties Union as they try to bully him into not cooperating with federal law enforcement officials. When the ACLU sued, Bill Elder stood strong. On defending our Second Amendment rights, Bill Elder stands tall. He supports concealed carry laws and understands that armed, law-abiding citizens help and not hinder law enforcement. Elder also supports allowing teachers who choose to carry concealed to do so. When it comes to firearms, Elder knows that he works for us - and not the other way around. Sheriff Elder has worked tirelessly to restore confidence and high morale to the sheriff’s office and has been very successful in doing so. In the largest Sheriff's office in the state with around 800 employees, the overwhelming majority of deputies are happy in their workplace and thriving professionally. This is the direct result of Sheriff Elder’s hard work to bring honor, integrity and strength to the El Paso County Sheriff’s Office. Can Mike Angley find one disgruntled employee and exploit him for his own political gain? Yes, he can. Bill Elder has been a fiscal conservative as well. Despite the rising pressure that marijuana legalization and other increases in crime have put on the Sheriff’s office, Elder has not asked for a tax increase. Period. He understands that government must do more with less and that politicians can’t keep coming to the tax trough every time they have difficult problems to solve. Elder is a sheriff and not a politician. He doesn’t attack his opponent – he just continues to keep El Paso County safe. He is deeply invested in our community because it is where he has spent 50 years of his life, and where he has practiced local law enforcement for almost 30 years. He truly is a hometown Sheriff. As I consider the values we share as a community and the aspects of El Paso County that we appreciate so much, I can find only one person in the Sheriff's race that embodies those values. That person is Bill Elder. It is for these reasons, and countless others, that it is my honor to wholeheartedly and enthusiastically endorse Sheriff Bill Elder for a second term as our hometown Sheriff. I am excited to cast my ballot for him and I hope you do the same.